Pizza is just about everyone’s favourite food and a pizza dip hits the spot. Especially for game days, family-friendly weeknight dinners, and those must-have-cheese-now situations. If you’re a cheese lover or a pizza fan you’re going to love this crust-less pizza dip. No crust means it’s naturally gluten-free dip which is nice if you’re entertaining to have that option. The dip is so fast and easy to make that you can have it assembled and in the oven in less than five minutes without dirtying a single bowl. The perfect kind of recipe. There are only 5 ingredients in the dip, and 3 of them are cheese. 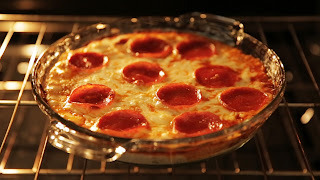 Cream cheese, mozzarella cheese, and parmesan cheese that are layered into pizza sauce and topped with pepperoni. If you’re a fan of doctored up pizza then feel free to add olives, spicy sausage, peppers, pineapple, or whatever else tastes good! Preheat oven to 375F. Spray a 9-inch pie dish (I used a glass Pyrex) with cooking spray. Evenly sprinkle 3/4 cup mozzarella over sauce. Evenly top with pepperoni slices. /Bake for about 20 to 25 minutes (I baked 23 minutes), or until cheese has melted and dip is done to your liking. Allow dip to cool momentarily before serving. Dip is best warm and fresh, but extra will keep airtight in the refrigerator for up to 5 days. Gently re-heat in micro before serving leftover portion. Read product labels to ensure all products are gluten-free if that's a consideration for you.